All prices listed in US Dollars. Other currencies will be converted according to the exchange rate of the US Dollar on the day of payment. Minimum booking days per hunter are 5 days. Reservations will be confirmed upon receipt of 50% of the total of the daily rates. The deposit will be forfeited should the booking be cancelled less than three months in advance. No cancellation fees are payable if a replacement client is booked. If any booking is cancelled less than 30 days in advance, the client will be kept responsible to pay not only the 50% advance or deposit, but the whole amount of the daily rates for the intended safari. 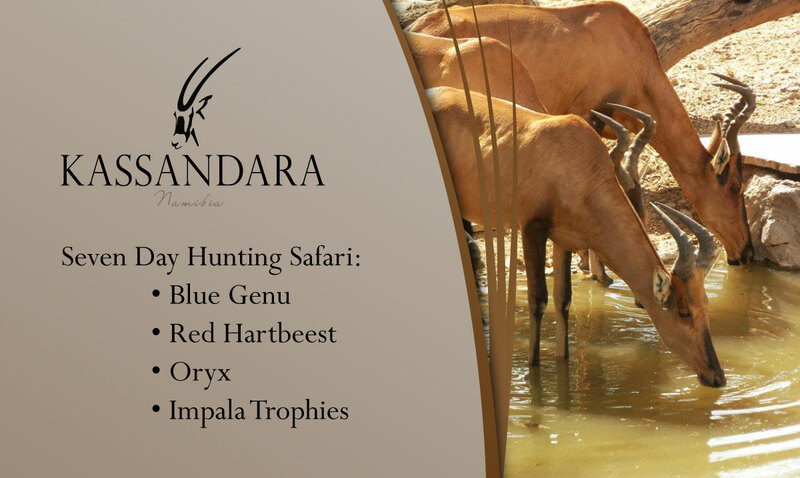 The balance, trophy fees and other personal charges are payable upon the conclusion of your safari. All payments must be made in the form of cash, bank guaranteed cheques or American Express traveller cheques only. Transfer to and from the International Airport is made by a shuttle service. Less than four passengers @ US$ 150.00 p/person and four and more persons, US$ 100.00 per person. 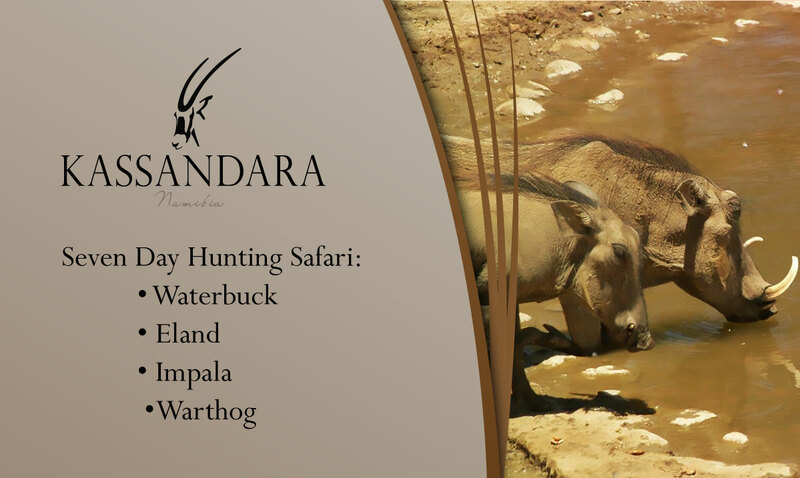 Kassandara Hunting and Safari Ranch provide facilities for both the rifle and bow hunter. 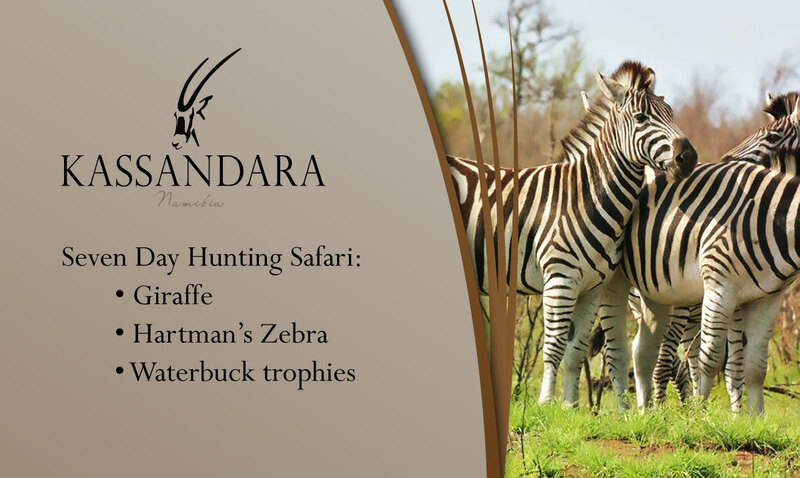 We offer our guests a wide range of activities: Clay Pigeon shooting, hiking trails, bird watching, game drives, coastal and dune safaris, Two day Etosha Safaris and any other part of Namibia which you would like to visit while visiting us. Please note that on your departure day, all rooms need to be vacated by 10H00. All rooms for guests are non smoking rooms. We stock sufficient and a variety of beers, wines and any other alcoholic beverages. Guests are asked not to cater for themselves by bringing their own alcoholic beverages.